WASHINGTON, DC, April 19, 2011 (ENS) – U.S. Energy Secretary Steven Chu Tuesday announced $5 million in new funding for community efforts to deploy electric vehicle infrastructure and charging stations. The funding opportunity furthers President Barack Obama’s stated goals of putting one million electric drive vehicles on the road in the United States by 2015 and reducing U.S. oil imports by one-third by 2025. Secretary Chu and Transportation Secretary Ray LaHood made the announcement on a conference call with Colorado Governor John Hickenlooper, Tucson Mayor Bob Walkup, and St. Paul Mayor Christopher Coleman – leaders of three of the nation’s nearly 100 Clean Cities coalitions. “The Department of Energy’s Clean Cities initiative is bringing together local governments and industry to demonstrate the benefits of advanced technology vehicles and help communities use less oil and gasoline to power their vehicles,” said Secretary Chu. 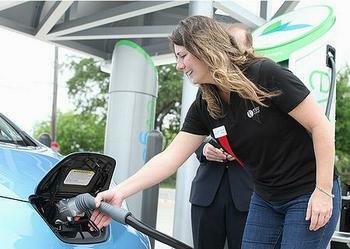 Since its inception in 1993, the Energy Department’s Clean Cities program has helped save nearly three billion gallons of gasoline. To share in the $5 million in electric vehicle funding announced today, local governments and private companies will partner to apply for funding to help accelerate installation of electric vehicle charging stations and infrastructure. Teaming arrangements are strongly encouraged, including one or more active designated Clean Cities Coalitions public or private fleets, auto dealerships, equipment manufacturers, energy marketers, utilities, local and regional planning entities, local and/or state agencies and transportation authorities. Approaches that include multiple local government entities and/or states are also encouraged. Communities will develop plans and strategies for electric vehicle deployment, update their EV permitting processes, develop incentive programs, or launch other local or regional initiatives to improve the experience of EV users and help bring EVs to the marketplace. Grants will be made in amounts between $250,000 and $500,000. Projects for fuels other than electricity will not be considered. Applicants are expected to submit plans for effective EV marketing, outreach, training, and education. This could include training for electric charging point users, first responders, public safety officers, inspectors, installers, and construction permitting officials in areas where electric charging is being introduced. The funding opportunity will serve as a pilot program to stimulate community-based electric vehicle infrastructure readiness planning and implementation activities in anticipation of larger electric vehicle deployment efforts in the future. But it is not part of the $200 million electric vehicle deployment program included in the President’s Fiscal Year 2012 budget request, the Energy Department said in its funding opportunity announcement. During the teleconference, Secretary Chu also outlined a previously announced partnership with Google, Inc. and more than 80 EV stakeholders to help EV drivers find charging stations anywhere in the country on Google Maps.